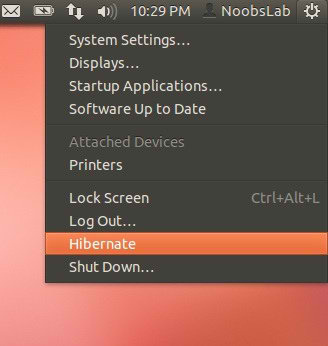 I use Ubuntu 12.04 and don't have the hibernate button anywhere. Isn't there any way by which I can set up the hibernate button rather than running the command: "sudo s2disk" everytime from the terminal? Open Terminal. Just press Ctrl+Alt+T on your keyboard to open Terminal. When it opens, run the command below. It will appear in the power menu! Not the answer you're looking for? Browse other questions tagged 12.04 power-management hibernate command-line or ask your own question.